The İstanbul 35th High Criminal Court put former Republican People’s Party (CHP) deputy Eren Erdem in pre-trial detention over his alleged links to Turkey’s Gülen group, which is accused by the Turkish government of masterminding a coup attempt in 2016. The ruling came as part of an ongoing investigation into Erdem’s work as a journalist when he was editor-in-chief of the Karşı daily. Mr Erdem is being accused of “aiding a terrorist organization without membership in it,” “revealing the identity of a secret witness” and “violating the confidentiality of a criminal investigation” in an indictment approved by the court in May 2018. He was detained by Turkish police on Friday and then sent to İstanbul’s Silivri prison on Saturday. “Hello everyone from Silivri [prison in İstanbul]. I am in high spirits. The very first thing I bought was a kettle when ı got to my cell. 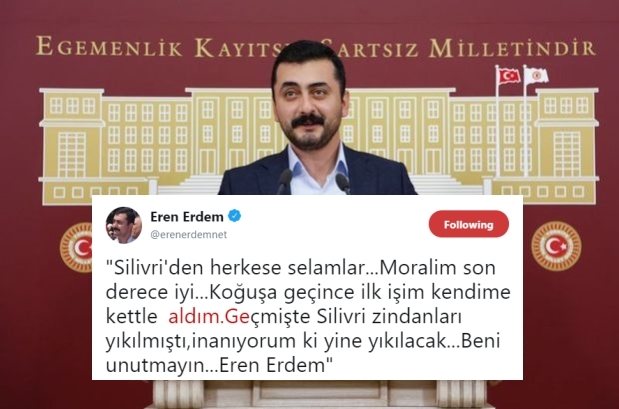 Silivri prison was once brought down in ruins and I believe it will be brought down once again,” Erdem tweeted after he was put in pre-trial detention in Silivri. Mr Erdem, an outspoken critic of the Turkish government and the management of his own party, CHP, was not included on his party’s nomination list for the June 24 general election. Several week ago, a trave ban was imposed the former deputy by the Istanbul 35th High Criminal Court after the same court accepted an indictment that demands 22 years in prison for Erdem for his articles in the Karşı daily about the Dec. 17-25, 2013 corruption investigations, which implicated four ministers and President Recep Tayyip Erdoğan’s family. Erdem served as editor-in-chief of Karşı, which was established on Feb. 9, 2014 and closed due to financial problems after only 66 days of operation. "Silivri'den herkese selamlar…Moralim son derece iyi…Koğuşa geçince ilk işim kendime kettle https://t.co/JVDLagGAOAçmişte Silivri zindanları yıkılmıştı,inanıyorum ki yine yıkılacak…Beni unutmayın…Eren Erdem"